The staff of The Beacon will once again be selling ads for inclusion in the 2019 senior issue of the newspaper. 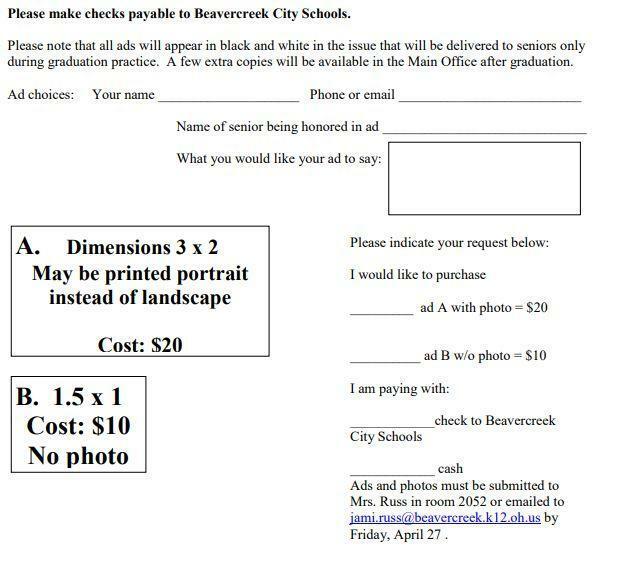 Please mail or drop off your ad request to Mrs. Jami Russ by Thursday, April 18. Any submissions submitted after that date will be returned without being printed in the paper. The school address is 2660 Dayton-Xenia Road, Beavercreek, OH 45434. There are two options for ads: a simple 3-line message in a box for $10 or a larger message with photo for $20. Please do not include professional senior photos unless you have purchased the rights to those photos. We’ll scan your submitted photo and return it to you if you provide a self-addressed stamped envelope with your order. 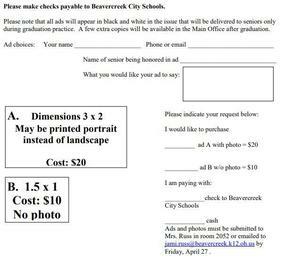 You may also email photos to jami.russ@beavercreek.k12.oh.us. Please make checks payable to Beavercreek City Schools. Please note that all ads will appear in black and white in the issue that will be delivered to seniors only during graduation practice. A few extra copies will be available in the Main Office after graduation. The form to purchase an ad can be found in the PDF link provided. Congrats to our 2019 BHS Grads!